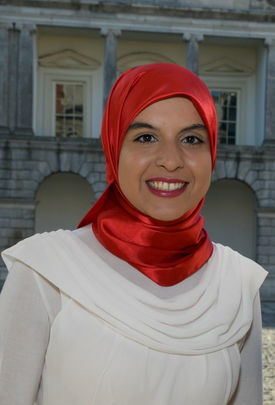 Khaoula Morchid is a Notre Dame alum (17’) and a former Naughton Fellow (18’) who completed her masters in Transport, Engineering, Policy and Planning at Trinty College Dublin. She is now working for AECOM in Dublin. 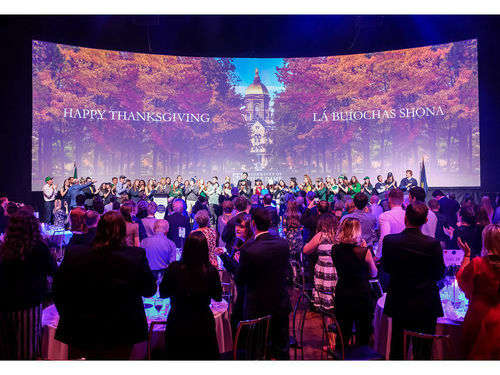 Celebrating 20 years in Ireland this year, the Dublin Global Gateway invited Morchid to share her story at the annual Thanksgiving event held at the Round Room, Mansion House. Below is a transcript of the speech that she wrote as a thank you letter to Ireland. Six years ago, I was sitting in the auditorium of my boarding school in South Africa listening to a Notre Dame admissions officer talk about the Fighting Irish. His emphasis on the strong community aspect of the Notre Dame family sounded exciting, but I didn’t quite understand it until I showed up on campus. Little did I know that the Notre Dame family extends beyond the borders of Indiana or the United States and that I would be joining the Irish side of the family after graduation. Little did I know that Dublin would be my home base, Wicklow mountains my go-to national park, and Ceili my favorite dance. I remember walking into the Notre Dame International office my freshman year and reading a quote by Father Malloy that said: “Our campus is in South Bend, Indiana; our classroom is the world." I took that quite literally and went on to study abroad in Australia, did research in different parts of Europe and Asia, but somehow never made it to Ireland. Cheering “go Irish” for four years and hearing about all that Ireland has to offer made me eager to visit the Emerald Isle. When I came across the Naughton Fellowship, I immediately decided to apply and make the move across the Atlantic Ocean. It’s been fourteen months since I moved here, but it feels much longer than that. Dublin quickly became home and the opportunities I was offered here made the past year an eventful one. As we celebrate Thanksgiving, I reflect on all the gifts I have been blessed with and I would like to express my deep gratitude to Ireland and its people for three main reasons. Thank you for the gift of kindness that inspires me to celebrate life every day and reminds me of how powerful the little things are. Having lived in four continents, I consider myself a global citizen and I felt at home in each of them, but Ireland is where I felt welcomed the most and I still do, so thank you for the great hospitality and for giving me a home away from home. Thank you for the gift of education. I moved to Ireland after receiving a Naughton Fellowship to pursue postgraduate studies at Trinity College Dublin and I am forever grateful for the educational experience itself and for all the doors it has opened for me. Studying at Ireland’s oldest university and being able to nurture my passion for transport through a multidisciplinary program drawing on the Irish experience as well as international case studies in the field has been a true privilege. I did my thesis on the impact of Brexit on the transport sector in Ireland, which was a challenging yet rewarding learning experience and I am grateful for the support I received from various Irish institutions. I graduated with distinction two weeks ago, but learning never ends. Thank you for the continuous gift of education that goes beyond the walls of a classroom and for the professional opportunities that I hope to build on as I embark on a new journey. I wouldn’t be where I am today without the support of Notre Dame, O’Connell House, the Naughton family, and everyone who helped me transition to Ireland and seek to thrive in it. Last but not least, thank you for the gift of inspiration. The more I learn about Ireland and its history, the more I get inspired by the resilience and perseverance of its people. It’s an honor to live here and witness first-hand how far the country has come and I am grateful for the opportunity to start my career in Ireland and contribute on a very small scale to its development. Last march, I attended the World Business Dialogue in Germany as the only delegate from Ireland and I felt a great sense of pride as I put a pin on Dublin in the world map where delegates pin where they come from. A few months later, I was selected to join the Dublin hub of the Global Shapers Community by the World Economic Forum. I met inspiring shapers from Ireland and others who are calling Ireland home like me, which has been a phenomenal experience. As I travel and meet shapers from other countries or welcome visiting shapers to Ireland, I am introduced as a Dublin shaper, which gives me great honor and a sense of responsibility to get more involved in the community and make a positive impact in my new home. For gifts of kindness, education, inspiration and much more, thank you Ireland for a truly meaningful experience so far and may I live to pay it forward. Wishing you all a joyful year full of blessings and gifts to be grateful for. Originally published by Colleen Wilcox at dublin.nd.edu on December 03, 2018.